1. Prepare Mango Relish: In medium bowl, combine all ingredients. Refrigerate until ready to serve. 2. Prepare Salmon: Prepare outdoor grill for direct grilling over medium-high heat. In small bowl, whisk together garlic, lemon juice, oil, salt, black pepper and red pepper. Coat salmon fillets with oil mixture. Place salmon fillets on hot grill rack. Cook 3 to 5 minutes per side or until fish turns opaque throughout and internal temperature reaches 145°. 3. 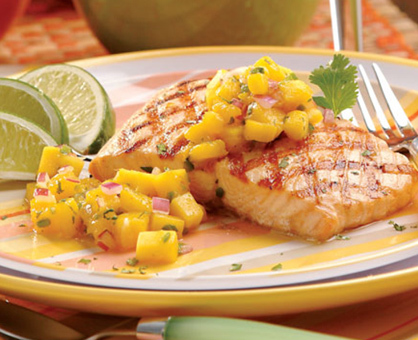 To serve, place salmon on serving plates and top each with Mango Relish. Garnish with lime wedges and cilantro.